The recipe is in some ways vintage Americana — it started out as a recipe on the side of a packet of pasta, back in the 90s, and called for dumping bottles of things together. 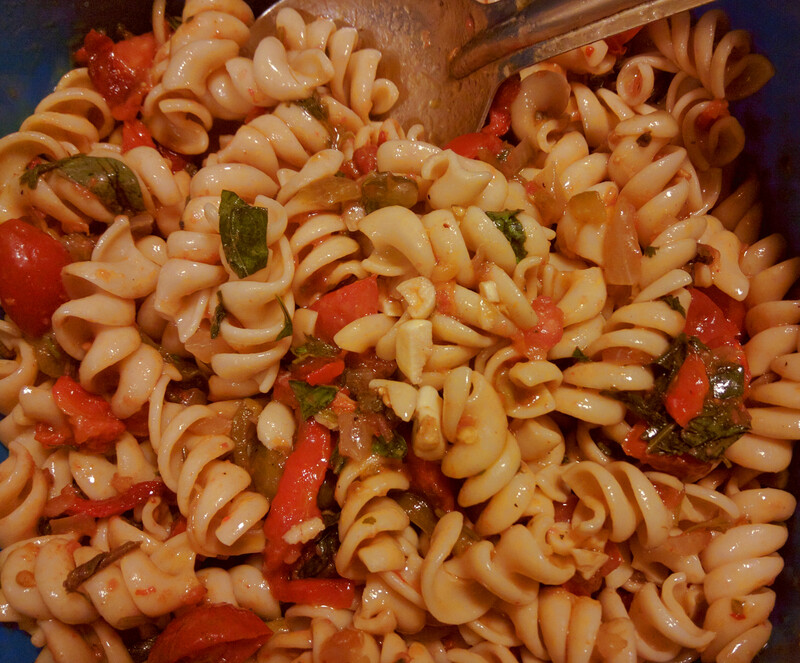 But, most of the ingredients were fresh, and it was my first introduction to salsa, and to fresh basil. The original recipe is apparently lost to time (I can’t find it anywhere on the internets), but I’ve kept it going — improving a few things. The original recipe calls for fresh bell peppers, but these can make the leftover salad unpleasantly bitter. Bell peppers taste better charred, anyway. You can substitute good bottled salsa for the grated tomato, if you like. It’ll be a bit faster. But it’s easy enough to make your own tomato pulp, and why not take advantage of the good summer tomatoes? Bring a large pot of water to a boil, and salt it. Cook the pasta only until al dente (still quite firm and chewy — but not crunchy!). Immediately drain it, and rinse the pasta in cold water to stop it from cooking any more. You can even throw it into a bowl with water and ice, to chill it very quickly. Roast the peppers over flames, or under a broiler. Clean them, and chop them into bite-size strips. Chop the firm tomatoes into bite size pieces (about 1 in, 2cm cubes). If they are watery, save the juice to use in the dressing (below). Peel and roughly chop the garlic. Add about 1/4 of the oil to a pan, and heat it up until a piece of garlic dropped into it sizzles. Don’t let it get smoking hot. Add the chopped garlic, and cook it in the oil until it’s just starting to turn brown and fragrant. Take the pan immediately off the heat. 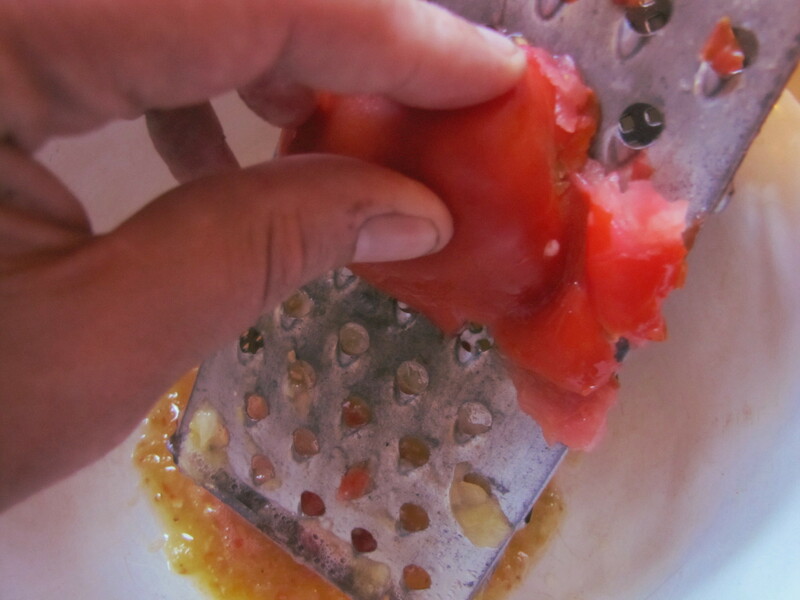 To make the salsa, grate the tomatoes into a bowl, getting as much flesh as you can off the skin. Discard the skin. The tomato is likely to be be pretty watery, unless you’ve used very pulpy tomatoes, like roma. In the next step, we’ll thicken just the juice, while leaving the pulp fresh. So pour, or strain (use cheesecloth, or a strainer), as much of the excess juice off the pulp as you can, into a bowl — don’t throw it out. Chop the onion into a relatively fine dice. Cook the onion, together with the chili and about a tablespoon of oil, in a pan over medium heat. Once the onion is turning transparent, but not yet soft, pour in the reserved tomato water. Reduce this until it is starting to get thick, and isn’t watery any more. Chop the cilantro, and add it. Stir this mixture together well, and turn off the heat. When the hot onion mixture has cooled down, add the vinegar and the fresh tomato pulp. Stir together. Stir the garlic oil, together with the remaining oil and salsa. Taste to see if it’s salty, vinegary, or spicy enough. Adjust to your liking. In a large bowl, toss all the solid ingredients together with the sauce, and chill at least half an hour, or overnight, before serving. This works well as leftovers, even for a couple of days. Like all pasta salads, though, you might need to re-adjust the seasoning before serving. If you know you’re not going to eat it all right away, you might add the tomatoes before serving. They’re better fresh, rather than sitting in the fridge. This would probably be good with mozarella or capers. You can substitute a decent bottled salsa for the fresh salsa, if you must.